College and career readiness is the stated goal of the common core standards that have now been adopted by almost all the states. The Obama administration’s proposed budget for 2013 included a new name for Title I of the Elementary and Secondary Schools Act: “college and career ready schools.” There is widespread agreement on the goal of preparing every high school graduate both for postsecondary education and for a lifetime of fulfilling work. 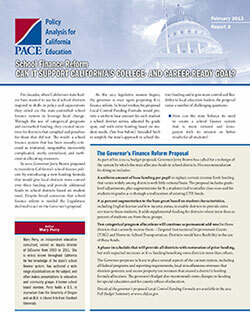 School Finance Reform: Can It Support California’s College and Career-ready Goal? For decades, when California’s state leaders have wanted to see local school districts respond to shifts in policy and expectations they relied on the state-controlled school finance system to leverage local change. Through the use of categorical programs and earmarked funding, they created incentives for districts that complied and penalties for those that did not. The result: a school finance system that has been roundly criticized as irrational, inequitable, excessively complicated, overly centralized, and inefficient at allocating resources. 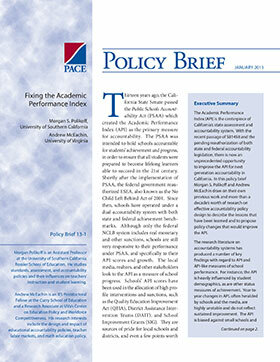 The Academic Performance Index (API) is the centerpiece of California’s state assessment and accountability system. With the recent passage of SB1458 and the pending reauthorization of both state and federal accountability legislation, there is now an unprecedented opportunity to improve the API for next generation accountability in California. 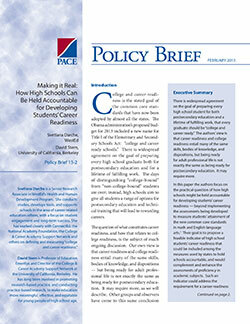 In this policy brief Morgan S.
California has long been viewed by the rest of the nation as leader in many areas, including education. The state’s K-12 and higher education systems were once the envy of other states. Of late, though, the news from the Golden State has not been so rosy. For the last three decades California has faced increased demands on public services while suffering through economic cycles that have had exaggerated effects on the state budget. The result has been increased competition for limited resources, budget uncertainty and steadily eroding state dollars for a local schools. Aiming to relieve overcrowded schools operating on multiple tracks, the Los Angeles Unified School District (LAUSD) has invested more than $19 billion to build 130 new facilities over the past decade. 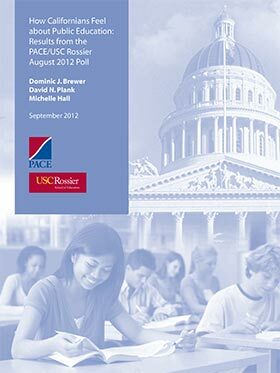 In a new PACE policy brief, William Welsh, Erin Coghlan, Bruce Fuller, and Luke Dauter from the University of California – Berkeley analyze the effects on student achievement of this massive initiative. Tracking thousands of students who moved from overcrowded to new facilities over the 2002-2008 period, the authors discovered robust achievement gains for many students. 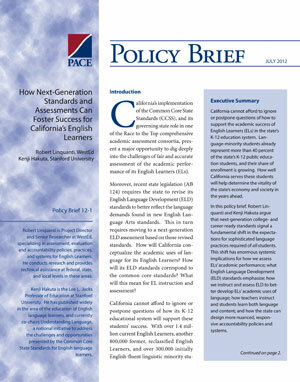 California cannot afford to ignore or postpone questions of how to support the academic success of English Learners (ELs) in the state’s K-12 education system. Language-minority students already represent more than 40 percent of the state’s K-12 public education students, and their share of enrollment is growing. How well California serves these students will help determine the vitality of the state’s economy and society in the years ahead. California's system of school finance is highly regulated and prescriptive. A large share of state funding is allocated through categorical programs; that is, programs whose funding is contingent on districts using the money in a particular way or for a particular purpose. In 2008–09, the strings were taken off 40 of those programs, collectively known as the "Tier 3" programs, as part of a budget deal that also reduced the funding for those programs. The author gathers evidence about how districts have responded to this fiscal freedom, particularly how resource allocations are made at the district level and what specific changes districts have made in their allocations. 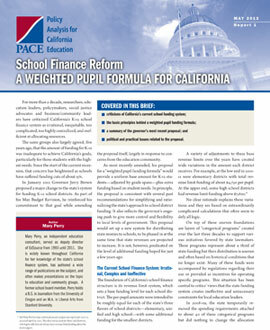 California's system of school finance is highly regulated and prescriptive. A large share of state funding is allocated through categorical programs, that is, programs whose funding is contingent upon districts using the money in a particular way or for a particular purpose. In 2008–09, the strings were taken off 40 of those programs, collectively known as the "Tier 3" programs, as part of a budget deal that also reduced the funding for those programs. Governor Jerry Brown has called for a major overhaul of California’s school finance policies. His proposal for a weighted pupil funding system would simplify the rules that govern the distribution of funds to schools and school districts, while targeting a larger share of available resources to the schools and students with the greatest needs. 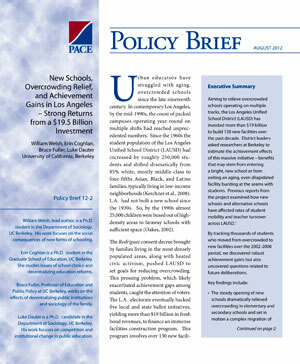 In this policy report Mary Perry offers an overview and analysis of the policy change that the Governor has proposed. 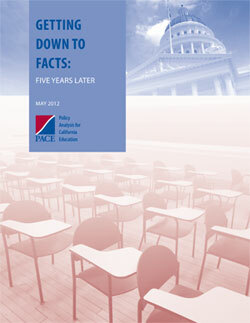 This report commemorates the fifth anniversary of the Getting Down to Facts project, which sought to provide a thorough and reliable analysis of the critical challenges facing California’s education system as the necessary basis for an informed discussion of policy changes aimed at improving the performance of California schools and students. The report focuses on the four key issues that received emphasis in the Getting Down to Facts studies: governance, finance, personnel, and data systems.